– As a main rule, a Flow Transmitter with a pipe dimension equal to the rest of the piping system should be selected. 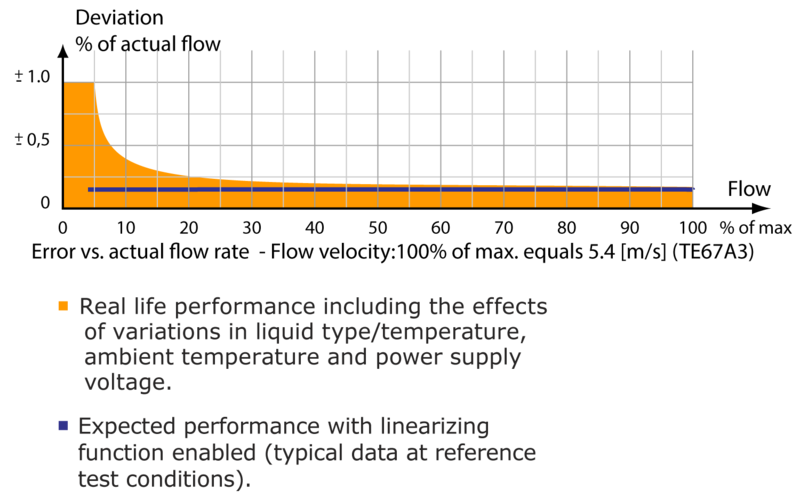 – Never exceed the maximum flow rate of the transmitter (see below). – If optimum measurement accuracy is primary concern, the smallest possible transmitter should be chosen, still observing that the maximum flow rate must under no circumstances be exceeded. – To further improve accuracy, especially on very low flow rates, the Linearizing function should be enabled. Please refer to the manual for details. – If the chosen metering section is smaller than the pipework in the installation, the connecting pieces should be tapered.